Jesse Evans (1853-??) – Jesse Evans was an outlaw and gunman of the Old West, and leader of the Jesse Evans Gang. Thought to have been born in either Missouri or Texas in 1853, Jesse had his first brush with the law when he was arrested along with his parents on June 26, 1871 in Elk City, Kansas for passing counterfeit money. In 1872 he drifted into New Mexico , where he worked on John Chisum’s ranch. Evidently, he found cowhandling too hard, as he soon became an outlaw, committing cattle rustling and armed robbery with the likes of Billy the Kid, Frank Baker, Pony Deal, Tom Hill, and others. Leading a gang of other outlaws, the men roamed throughout New Mexico, often working with other gangs in their quest for easy pickings. 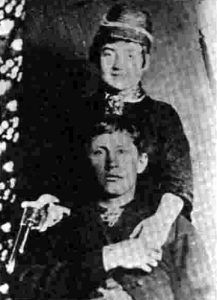 When the Lincoln County War erupted, the Murphy-Dolan faction hired the Evans Gang as enforcers; interestingly, on the opposing side was none other than Billy the Kid. Later, when a price was placed on his head, Evans fled to Southwest Texas, where he and his cohorts resumed their cattle rustling activities. However, they were finally tracked down by Texas Rangers near Presidio on July 3, 1880. In the ultimate gunfight that occurred, Jesse Evans shot and killed Texas Ranger George Bingham, and gang member John Gross was killed by rangers. The members of the gang were finally forced to surrender. Evans was sentenced to prison in Huntsville but managed to escape from a work detail in May, 1882 and was never heard from again.